Honor, a leading smartphone e-brand, officially introduced Honor 10 as its 2018 flagship smartphone today in front of over 250 media, partners, and fans in Jakarta, Indonesia. The launch brought to life the concept of "Beauty in AI", a pioneer in bringing a whole new user experience in smartphone photography, as well as revealing three major ground-breaking, industry leading smartphone technologies. The first leading feature is the advanced AI 2.0 technology, applied chiefly to the smartphone's dual-lens camera. The second is the Honor 10's CMF design, a 3D glass back with a stunning nano-scale optical coating composed of 15 layers of shimmering color, created by The Paris Aesthetics Center. The third is GPU Turbo, a revolutionary graphics processing acceleration with sophisticate hardware-software integration that dramatically increases graphics processing efficiency of mobile phones, which will provide users with a smoother and faster mobile experience. Armed with three major breaking innovation, the Honor 10 will be available at IDR 6.999.000 for pre-order at Lazada from August 6th to August 10th at 11:00 AM. "We believe that the recipe for success is simple: by giving consumers a really good product! 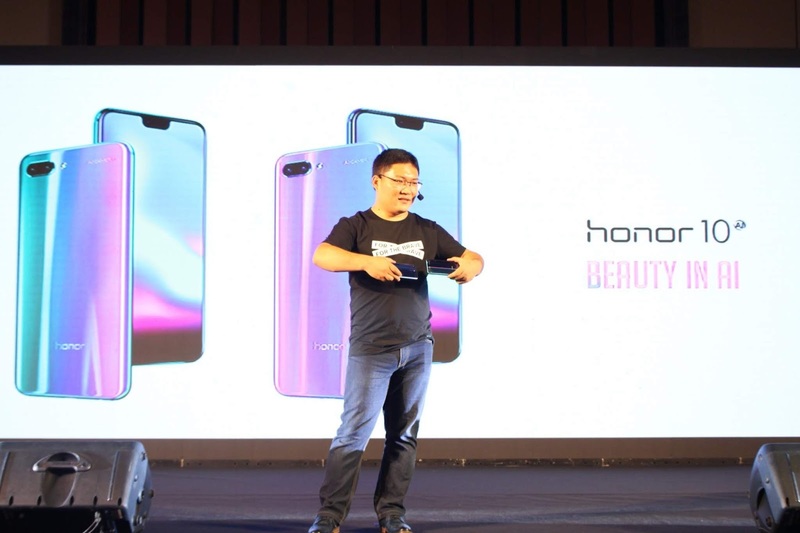 That's what we work hard to achieve at Honor," said James Yang, President of Honor Indonesia, "However, we don't just make good products, but we want to co-create a new lifestyle with young people worldwide. With the introduction of Honor 10, an unrivaled product with unbeatable value, we believe that we can achieve our goal to be one of the top three smartphone brands in Indonesia in the next three years." Honor believes in the power of co-creation. Today, Honor also announced its partnerships with gaming partner, Gameloft; live-streaming applications, Bigo Live, Live.me, Nonolive, Kittylive, Uplive, 17; and short movie application, Kwai Go. Working closely together with its strategic partners and the Honor community, Honor will continue to co-create a brand experience like no other for digital natives in Indonesia. "We are very excited to collaborate with Honor as a leading smartphone e-brand that continues to create stunning devices. Honor 10 is definitely a perfectly adapted Phone for experiencing Gameloft games! The GPU (Graphic Processing Unit) turbo is designed to improve the energy efficiency and general performance when playing graphically-intensive games. Those improvements are definitely serving the game experience that Gameloft wants to offer to its users," said Arthur Constant, Country Manager of Gameloft Indonesia. With its innovative devices and precise targeting strategy, Honor continues to lead the industry in its home market as the No. 1 smartphone e-brand in China, while expanding rapidly overseas, including Indonesia. The brand has achieved 150% increase year-on-year in international sales volume outside of China in the first half of 2018. In Indonesia, Honor just released its half year sales result with remarkable achievement by 100% monthly growth in the first half of 2018. In May this year, Honor surpassed Apple to become Russia's No. 2 smartphone brand in terms of sales volume. The brand is also the fastest growing smartphone vendor in India, with a 300% increase in sales volume and revenue in the first half of 2018. Honor 10 24MP+16MP dual-lens AI camera was developed and supported by the Neural Processing Unit (NPU) processor in the Kirin 970 chipset, which means it recognizes 500+ scenarios in 22 categories in real-time. It can pinpoint the outlines of various surrounding objects, like the sky, plants, people or even a waterfall, and identify their locations instantly. This feature is supported by the industry-first Semantic Image Segmentation technology, which allows Honor 10 to identify multiple objects in one single image. It is here where Honor 10 really stands out from the crowd. These industry-first features in Honor 10 apply scene-specific parameters to each photo in real-time when taking a picture, making every photo taken looks like a professional shot with only just one click. The AI 2.0 technology on Honor 10 is not only supporting its rear camera, but also its 24MP front camera, which makes this device acts as the user's intelligent selfie companion. It supports 3D face recognition, optimizes facial details and detects over a hundred facial points to pixel-level accuracy. Honor 10's front camera also supports studio lighting effects with a range of lighting conditions. The advanced and precise facial recognition ensures an accurate bokeh, and captures subtle features of everyone's face, even in a 'groufie' shot. Honor 10 will receive an AIS software upgrade, an image enhancement that minimizes blurring and compensates for device shake while capturing photos and video. Within 0.2 seconds, the software detects if the device is handheld with 98% accuracy and automatically sets the exposure and framing using AI scene recognition. The process taken to achieve Honor 10's minimalist finish wasn't simple, it was a result of a series of world-class industrial techniques and sophisticated engineering processes, which required the utmost precision and delicate handling. Honor 10 glass design is made with 15 layers of 3D glass on the back, and this design reveals a colorful rear body. Immersed in art history and the digital world, the Honor 10 brings a stunning combination of colors to consumers - the Phantom Blue and Phantom Green. These two iconic and ground-breaking colors were created at The Paris Aesthetics Center, where the creativity and enthusiasm of Honor engineers and designers came to life. The Honor 10 is powered by an independently built-in NPU processor. The 4GB RAM and 64GB/128GB ROM storage gives sufficient space to stock all your exciting moments recorded in galleries, apps and files. The Honor 10 also comes with Honor Super Charge 5V/4.5A with the 3,400 mAh (typical value) battery, it can recharge 50% of power within 25 minutes. Honor 10 uses the latest EMUI 8.1 user interface, which represents an overall upgrade in software function and capability, and particularly features the Easy Talk function, which reduces background noise in a windy environment when the user is talking handsfree on the road, it also increases the volume of whispering for quiet conversations. GPU Turbo is a hardware-software integrated graphics processing acceleration technology. It reconstructs the traditional graphics processing framework at the lower layer system, greatly improving the user experience. This technology breakthrough can improve graphics processing efficiency by 60%, while reducing the SoC (System on Chip) energy consumption by 30%, taking mobile gaming to the next level. It is also available in Midnight Black.